Remember, remember, the eighth of November; of gunpowder, treason and plot. Benjamin, do you recall sixteen years ago how we sat all night before the black-and-white Great Wall television set (with its hues of light green on a warped electronic day) set against the cracked wall of that desolate farmhouse in Ngong (where Dad would later die, alone, all swelled up and purple from the cirrhosis) and watched the Gore/Bush election go down to hanging chads? Remember that bad joke I cracked about them knowing how to swing ‘em down in Ndjamena? You still laughed hard and long. And do you remember how, eight years later, on another November night—November 4th, who can ever forget?—after watching the Roma vs. Chelsea FC game on DSTV (Roma won 3 to 1), we changed the channel to CNN and stayed up all night to see history made: Barack Obama, born of a Kenyan father, became the forty-fourth president of that great United States of America? A loud roar went up from many flats in our building block as Wolf Blitzer said, “Barack Obama has just been elected…” and we dashed out of our flat to go drink beer with those two bearded brothers, our Iranian jiranis, whom we’d never said “hallo” to before. In a Time interview a year later, President Obama would make it clear that “the arc of the moral universe is long, but it bends towards justice.” Indeed it seemed that arc always began in America, and I imagined it arching across the world, ocean and land and ocean again, until its end settled somewhere in the middle of the Tasmania Sea. Residents of Wollongong would look East, and denizens of Wellington would look West, and with The Pet Shop Boys as audio backdrop, see a rainbow from sea to same shining sea. Speaking of Tasmania, there was a popular cartoon program in Kenya back in the early 1990s called Taz-Mania starring a crazy Tasmanian devil called Taz. A typical episode featured Taz terrorizing his neighbors, the Platypus Brothers, after a thunderstorm cut off TV cable in his cave. The Americans, however manic, could never elect this caveman, this real life Tasmanian devil on television, this modern-day Neanderthal, this rogue and rascal, this disgrace of a scapegrace and international vaudeville villain to be President of the USA, could they? Afghans, Belarusians, Chadians, Greek Turkish Cypriots, East Timorese, Emiratis, Farorese, Gambians, Guatemalans, nationals of Guinea-Bissau, Guyanese, the French, I-Kiribati, Kazakhs, Kyrgyzs, Palauans, Sindhians, Togolese or Tobagonians, Uzbeks, Ugandans, watu wa Vanatu, Yemenis, Zambians, or Zimbwabweans, I could understand; but Americans would never vote such a scoundrel to the White House. So as Trump took the swing state of Florida, I was not overly worried. I went out to the balcony of my 6th-floor loft, variously called The Penthouse, and then The Pantyhose, by an old friend who used to bring his girls over for mischief. I myself simply called it 5Q, incongruous because the plate on the dark wood door was actually labeled D4, but in a world that made less sense by the day, why not? 5Q. The pink fingers of dawn…okay, so a pre-proper morning sky then, of light blue and cat-orange and purple hues (last night’s residue), like the plumage of some exotic African bird. There was the sing-song in the trees below, some pretty commonplace bird, and a lamppost-head emerging from the trees to shine its 5:55 a.m. spotlight on a middle-aged lady waiting for a matatu in the shade of the tree. I looked up at the skyline, after all that was why I had taken the slightly ridiculous mortgage on 5Q, and took in the dawn passenger airplane slicing this November sky as the world tilted on its axis, and the surreal sight of cars racing over a bridge built just above the tree line so that it seemed as if the vehicles were driving on treetops, and the gaudy white Airtel building in the distance (something Trump would have been proud to build), and the huge empty neon billboard shining out of those trees, empty but for the “ADVERTISE HERE” statement blinking in blue and red, like orders from a war general one dares not defy. Say, WWII General Georgy K. Zhukov, or…Idi Amin Dada. A honk from a matatu took me back down to earth. One of the ‘Tel Aviv’ passenger PSVs that plies our South B route careened around the corner. I thought it would stop for the woman under the lamplight, and so did she. She stepped forward, and for a micro-second its metal hulk obscured her, then it whizzed by her, no doubt for the richer fishing grounds of commuters at a proper bus-stop. I could not see her face from my 6th-floor Eagle’s Lair (or at least, Crows’ Ledge, for crows sometimes came to the balcony to crook crumbs from meals consumed outside), and the grey light of the morning made it hard to see features, but I could discern her great disappointment at having been left behind by the sudden defeated slump of her shoulders. The magic of the morning broken, I returned to the warm interior of 5Q, waiting to switch from MSNBC to FOX News when Hilary Clinton won, hoping to see the smug face of Sean Hannity when she did, never mind that Ohio also looked to have taken the low road. CNN on American presidential election night didn’t seem right without my kid-brother, Ben, who had passed away nine months after we watched Barack win a second term. The whole of Kenya, with the exception of Obama’s embittered half-brother, Malik, was rooting for Hillary. At the media company where I work, people had “I’m With Her“ signs. A television anchor called Joy D. Biira even had an ‘H’ bumper sticker on her Mercedes Benz. They had given the world the first black president of the USA, and now they were going to give us its first female president. America the Great! America the Wonderful! America the (Superlative)! Then “the ten electoral votes of Wisconsin” followed by “Donald Trump to win,” and America had just elected the real Tasmanian devil, thanks to TrumpTaz-mania, to the office he is least qualified to hold. I heard the world’s collective groan that morn, right there in my living room. Actually, I heard nothing beyond “Wisconsin”; instead I saw sixty million cracks crisscross my television screen, and wild thorns, or perhaps the seng’eng’e (barbed wire atop a wall), grew before my eyes. This is what despair feels like. 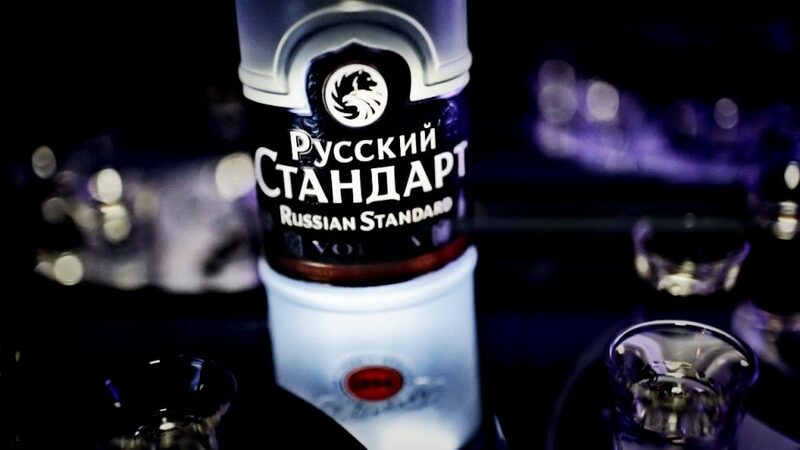 What it tasted like was PyccKNN CTAH—apt—Russian Standard vodka, which my friend Alexei had given me the day before in anticipation of Mrs. Clinton’s victory. On looking at the label Cyrillics, I had said, “Pushkin Czar Apartments.” Alexei, not understanding the joke, laughed anyway. I did not bother to go to the refrigerator to get a Cola; I swigged the vodka straight from the bottle, feeling its fiery slosh down my esophagus, wanting the blackout it offered, the anesthesia it promised from this existential pain brought about by that 270+ number on my television. All the while I knew, even as I fell into a catatonic and dreamless (like America now!) sleep, I was going to awaken to the beginning of a nightmare that would run at least four years, in the now-blind USA! USA! USA! Post-sleep: I wake in the menacing colorless light of a midweek November afternoon, cradling my newfound BFF and transitional object, a stuffed Santa, which I have named Santa Misha. I spot the Russian Standard leaking its contents, as blank as this afternoon light, onto my thin white carpet. I have a headache and that particular languor caused by daytime siestas one is unaccustomed to (okay, so, midday brown-outs). I’m seeing double from the drink, or at the very least, the wrong way round. Because those two Cyrillic Ns on the vodka bottle seem to have reversed themselves from what may as well be hieroglyphics to the untrained eye to stand straight up, forty-five-degree skids of constant consonants: Instead of “NN” they appear to me like “SS,” the symbol for the Nazi Party’s Schutzstaffel. Cosmonauts returned to an alien planet where the world is a mirror image of Earth, spinning in the opposite direction so that the sun sinks in the East.